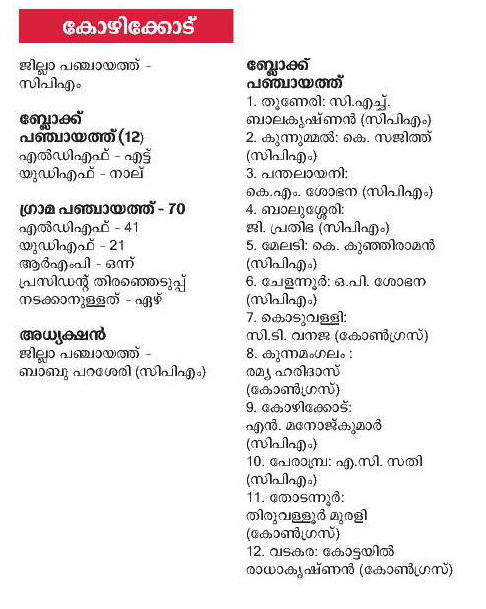 Here is the details of Local Body Presidents / Panchayat Presidents in Kozhikode District. Panchayat President Election in Kerala was on 19th November 2015. Details Presidents in each Panchayats in Kozhikode District are available here. There are 12 block Panchayats and 70 Grama Panchayats in Kozhikode District. Kozhikode District Panchayat President is Babu Parassery (LDF).